An early refrigerator car design, circa 1870. Hatches in the roof provided access to the ice tanks at each end of the car. 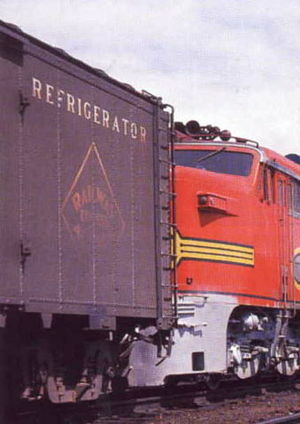 A refrigerator car (or "reefer") is a refrigerated boxcar, a piece of railroad rolling stock designed to carry perishable freight at specific temperatures. Refrigerator cars differ from simple insulated boxcars and ventilated boxcars (commonly used for transporting fruit), neither of which are fitted with cooling apparatus. Reefers can be ice-cooled, come equipped with any one of a variety of mechanical refrigeration systems, or utilize carbon dioxide (either as dry ice, or in liquid form) as a cooling agent. Milk cars (and other types of "express" reefers) may or may not include a cooling system, but are equipped with high-speed wheelsets and other modifications that allow them to travel with passenger trains. Reefer applications can be divided into four broad groups: 1) dairy and poultry producers require refrigeration and special interior racks; 2) fruit and vegetable reefers tend to see seasonal use, and are generally used for long-distance shipping (for some shipments, only ventilation is necessary to remove the heat in transit created by the ripening process); 3) manufactured foods (such as canned goods and candy) as well as beer and wine do not require refrigeration, but do need the protection of an insulated car; and 4) meat reefers come equipped with specialized beef rails for handling sides of meat, and brine-tank refrigeration to provide lower temperatures (most of these units are either owned or leased by meat packing firms). Illinois Central Railroad #14713, a ventilated fruit car dating from 1893. After the end of the American Civil War, Chicago, Illinois emerged as a major railway center for the distribution of livestock raised on the Great Plains to Eastern markets. Getting the animals to market required herds to be driven up to 1,200 miles (2,000 kilometers) to railheads in Kansas City, Missouri where they were loaded into specialized stock cars and transported live ("on-the-hoof") to regional processing centers. Driving cattle across the plains also led to tremendous weight loss, and some animals were lost along the way. Upon arrival at the local processing facility, livestock were either slaughtered by wholesalers and delivered fresh to nearby butcher shops for retail sale, smoked, or packed for shipment in barrels of salt. Costly inefficiencies were inherent in transporting live animals by rail, particularly the fact that about sixty percent of the animal's mass is inedible. The death of animals weakened by the long drive further increased the per-unit shipping cost. Meat packer Gustavus Swift began looking for a way to ship dressed meats from his packing plant in Chicago to the East. A number of attempts were made during the mid-1800s to ship agricultural products via rail car. As early as 1842, the Western Railroad of Massachusetts was reported in the June 15 edition of the Boston Traveler to be experimenting with innovative freight car designs capable of carrying all types of perishable goods without spoilage. The first refrigerated boxcar entered service in June 1851, on the Northern Railroad of New York (or NRNY, which later became part of the Rutland Railroad). This "icebox on wheels" was a limited success in that it was only able to function in cold weather. That same year, the Ogdensburg and Lake Champlain Railroad (O&LC) began shipping butter to Boston in purpose-built freight cars, utilizing ice to cool the contents. The first consignment of dressed beef left the Chicago stockyards in 1857 in ordinary boxcars retrofitted with bins filled with ice. Placing meat directly against ice resulted in discoloration and affected the taste, and proved impractical. During the same period Swift experimented by moving cut meat using a string of ten boxcars which ran with their doors removed, and made a few test shipments to New York during the winter months over the Grand Trunk Railway (GTR). The method proved too limited to be practical. A builder's photo of one of the first refrigerator cars to come out of the Detroit plant of the American Car and Foundry Company (ACF), built in 1899 for the Swift Refrigerator Line. Detroit's William Davis patented a refrigerator car that employed metal racks to suspend the carcasses above a frozen mixture of ice and salt. He sold the design in 1868 to industrialist George H. Hammond, a Detroit meat packer, who built a set of cars to transport his products to Boston using ice from the Great Lakes for cooling. The load had the tendency of swinging to one side when the car entered a curve at high speed, and the use of the units was discontinued after several derailments. In 1878 Swift hired engineer Andrew Chase to design a ventilated car that was well insulated, and positioned the ice in a compartment at the top of the car, allowing the chilled air to flow naturally downward. The meat was packed tightly at the bottom of the car to keep the center of gravity low and to prevent the cargo from shifting. Chase's design proved to be a practical solution to providing temperature-controlled carriage of dressed meats, and allowed Swift and Company to ship their products all over the United States and internationally. Swift's attempts to sell Chase's design to major railroads were rebuffed, as the companies feared that they would jeopardize their considerable investments in stock cars, animal pens, and feedlots if refrigerated meat transport gained wide acceptance. In response, Swift financed the initial production run on his own, then — when the American roads refused his business — he contracted with the GTR (a railroad that derived little income from transporting live cattle) to haul the cars into Michigan and then eastward through Canada. 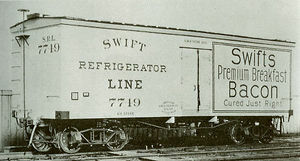 In 1880 the Peninsular Car Company (subsequently purchased by ACF) delivered the first of these units to Swift, and the Swift Refrigerator Line (SRL) was created. Within a year the Line’s roster had risen to nearly 200 units, and Swift was transporting an average of 3,000 carcasses a week to Boston, Massachusetts. Competing firms such as Armour and Company quickly followed suit. By 1920 the SRL owned and operated 7,000 of the ice-cooled rail cars. The General American Transportation Corporation assumed ownership of the line in 1930. An advertisement taken from the 1st edition (1879) of the Car-Builders Dictionary for the Tiffany Refrigerator Car Company, a pioneer in the design of refrigerated railroad cars. 1880 1,000 est. 310 1,310 est. 1885 5,010 est. 990 6,000 est. 1890 15,000 est. 8,570 23,570 est. 1895 21,000 est 7,040 28,040 est. 1900 54,000 est. 14,500 68,500 est. Men harvest ice on Michigan's Lake Saint Clair, circa 1905. The ice would be cut into blocks and hauled by wagon to a cold storage warehouse, and held until needed. The use of ice to refrigerate and thus preserve food dates back to prehistoric times. Through the ages, the seasonal harvesting of snow and ice was a regular practice of many cultures. China, Greece, and Rome (to name a few) all stored ice and snow in caves or dugouts lined with straw or other insulating materials. Rationing of the ice allowed the preservation of foods during hot periods, a practice that was successfully employed for centuries. For most of the 1800s, natural ice (harvested from ponds and lakes) was used to supply refrigerator cars. At high altitudes or northern latitudes, one foot tanks were often filled with water and allowed to freeze. 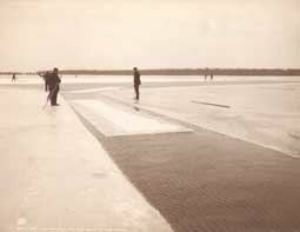 Ice was typically cut into blocks during the winter and stored in insulated warehouses for later use, with sawdust and hay packed around the ice blocks to provide additional insulation. A late-19th century wood-bodied reefer required reicing every 250 to 400 miles. By the turn of the 20th Century manufactured ice became more common. The Pacific Fruit Express (PFE), for example, maintained 7 natural harvesting facilities, and operated 18 artificial ice plants. Their largest plant (located in Roseville, California) produced 1,200 "short" tons of ice daily, and Roseville’s docks could accommodate up to 254 cars. At the industry’s peak, 13 million short tons of ice was produced for refrigerator car use annually. Top icing was the practice of placing a 2- to 4-inch layer of crushed ice over the top of agricultural products that have high respiration rates, need high relative humidity, and benefit from having the cooling agent sit directly atop the load (or within individual boxes). Cars with pre-cooled fresh produce were top iced just before shipment. Top icing added considerable dead weight to the load. Top-icing a 40-foot reefer required in excess of 10,000 pounds of ice. It had been postulated that as the ice melts, the resulting chilled water would trickle down through the load to continue the cooling process. It was found, however, that top-icing only benefited the uppermost layers of the cargo, and that the water from the melting ice often passed through spaces between the cartons and pallets with little or no cooling effect. It was ultimately determined that top-icing is useful only in preventing an increase in temperature, and was eventually discontinued. Top icing bagged vegetables in a refrigerator car. Workmen fill up an FGE reefer's top-mounted bunkers with crushed ice. Ice blocks (also called "cakes") are manually placed into reefers from a covered icing dock. The "business end" of a mechanical ice loading system services a line of Pacific Fruit Express refrigerator cars. Joel Tiffany's design mounted the ice tank in a clerestory atop the car's roof, and relied on a train's motion to circulate cool air throughout the cargo space. This engraving of Tiffany's original "Summer and Winter Car" appeared in the Railroad Gazette just before Tiffany received his refrigerator car patent in July, 1877. The cars were cleaned with hot water or steam. Depending on the cargo, the cars might have undergone 4 hours of "pre-cooling" prior to loading, which entailed blowing in cold air through one ice hatch and allowing the warmer air to be expelled through the other hatches. The practice, dating back almost to the inception of the refrigerator car, saved ice and resulted in fresher cargo. The cars' ice bunkers were filled, either manually from an icing dock, via mechanical loading equipment, or (in locations where demand for ice was sporadic) using specially-designed field icing cars. The cars were delivered to the shipper for loading, and the ice was topped-off. Depending on the cargo and destination, the cars may have been fumigated. The train would depart for the eastern markets. The cars were re-iced in transit approximately once a day. Upon reaching their destination, the cars were unloaded. If in demand, the cars would be returned to their point of origin empty. If not in demand, the cars would be cleaned and (if possible) used for a dry shipment. Refrigerator cars required effective insulation to protect their contents from temperature extremes. "Hairfelt" derived from compressed cattle hair, sandwiched into the floor and walls of the car, was inexpensive but flawed — over its three- to four-year service life it would decay, rotting out the car's wooden partitions and tainting the cargo with a foul odor. The higher cost of other materials such as "Linofelt" (woven from flax fibers) or cork prevented their widespread adoption. Synthetic materials such as fiberglass and polystyrene, both introduced after World War II, offered the most cost-effective and practical solution. A Pullman-built "shorty" reefer bears the Armour Packing Co. · Kansas City logo, circa 1885. A pre-1911 "shorty" reefer bears an advertisement for Anheuser-Busch's Malt Nutrine tonic. 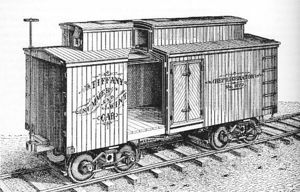 A rare double-door refrigerator car utilized the "Hanrahan System of Automatic Refrigeration" as built by ACF, circa 1898. Merchants Despatch Transportation Co. #11329, on display at the Pan-American Exposition in 1901. In the latter half of the 20th Century mechanical refrigeration began to replace ice-based systems. Mechanical refrigeration units replaced the "armies" of personnel required to re-ice the cars. In the 1960s the "plug" door was introduced, providing a larger opening to facilitate loading and unloading. These tight-fitting doors were better insulated and could maintain a more even temperature inside the car. By the mid-1970s those few remaining ice bunker cars were relegated to "top ice" service, where crushed ice was applied atop the commodity. A first-generation steel refrigerator car (Pacific Fruit Express #458330) sits on a siding at Denver, Colorado in March 1970. © Drawing: Pacific Fruit Express Co.
A cutaway illustration of a conventional mechanical refrigerator car, which typically contained in excess of 800 moving parts. State-of-the-art mechanical refrigerator car designs place the removable, end-mounted refrigeration unit outside of the freight compartment in order to facilitate access for servicing or replacement. A modern mechanical refrigerator car, outfitted for high-speed service, bears the colors and markings of Amtrak's ExpressTrak, the railroad's freight and shipping service. 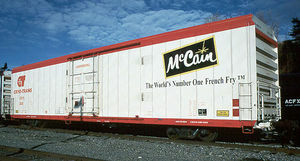 Cryogenic refrigerator cars, such as those owned and operated by Cryo-Trans, Inc., are still used to transport frozen food products, including french fries. Today, Cryo-Trans operates a fleet in excess of 515 cryogenic rail cars. The Topeka, Kansas shops of the Santa Fe Railway built five experimental refrigerator cars employing liquid nitrogen as the cooling agent in 1965. A mist of liquified nitrogen was released throughout the car if the temperature rose above a predetermined level. Each car carried 3,000 pounds (1,360 kilograms) of refrigerant and could maintain a temperature of minus 20 degrees Fahrenheit (−30 °Celsius). During the 1990s, a few rail car manufacturers experimented with the use of liquid carbon dioxide (CO2) as a cooling agent. The move was in response to rising fuel costs, and was an attempt to eliminate the standard mechanical refrigeration systems that required periodic maintenance. The CO2 system can keep the car's load frozen solid as long as 14 to 16 days. Several hundred "cryogenic" refrigerator cars were placed in service transporting frozen foodstuffs, though they failed to gain wide acceptance (due, in part, to the rising cost of liquid carbon dioxide). Since cryogenic refrigeration is a proven technology and environmentally friendly, the rising price of fuel and the increased availability of carbon dioxide from Kyoto Protocol-induced capturing techniques may lead to a resurgence in cryogenic railcar usage. Cryo-Trans, Inc. (founded in 1985) has since dedicated 200 of its refrigerated cars to wine transportation service. 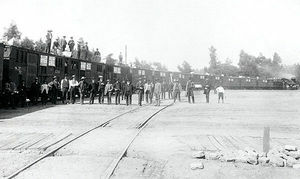 A special fast fruit train leaving Central Pacific Railroad passenger station, June 24, 1886. This train was chartered by W. R. Strong & Co. and Edwin T. Earl, fruit packers and shippers, Sacramento. 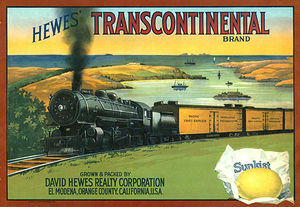 A crate label for Hewes' Transcontinental Brand of El Modena, California, circa 1930 depicts a trainload of Pacific Fruit Express (PFE) ventilated refrigerator cars passing near San Francisco Bay. Railway Express Agency refrigerator car #6687, a converted World War II troop sleeper. An REA express reefer is positioned at the head end of Santa Fe train No.8, the Fast Mail, in 1965. 1842: The Western Railroad of Massachusetts experiments with innovative freight car designs capable of carrying all types of perishable goods without spoilage. 1851: The first refrigerated boxcar enters service on the Northern Railroad of New York. 1857: The first consignment of refrigerated, dressed beef travels from Chicago stockyards to the East Coast in ordinary box cars packed with ice. 1866: Horticulturist Parker Earle ships strawberries in iced boxes by rail from southern Illinois to Chicago on the Illinois Central Railroad. 1868: William Davis of Detroit, Michigan develops a refrigerator car cooled by a frozen ice-salt mixture, and patents it in the U.S. The patent is subsequently sold to George Hammond, a local meat packer who goes on to amass a fortune in refrigerated shipping. 1876: German engineer Carl von Linde develops one of the first mechanical refrigeration systems. 1878: Gustavus Swift (along with engineer Andrew Chase) develops the first practical ice-cooled rail car; soon thereafter, Swift forms the Swift Refrigerator Line (SRL), the world's first. 1880: The first patent for a mechanically-refrigerated rail car issued in the United States is granted to Charles William Cooper. 1884: The Santa Fe Refrigerator Despatch (SFRD) is established as a subsidiary of the Atchison, Topeka and Santa Fe Railway to carry perishable commodities. 1885: Berries from Norfolk, Virginia are shipped by refrigerator car to New York. 1887: Parker Earle joins F.A. Thomas of Chicago in the fruit shipping business. The company owns 60 ice-cooled rail cars by 1888, and 600 by 1891. 1888: Armour & Co. ships beef from Chicago to Florida in a car cooled by ethyl chloride-compression machinery. Florida oranges are shipped to New York under refrigeration for the first time. 1889: The first cooled shipment of deciduous fruit from California is sold on the New York market. 1898: Russia's first refrigerator cars enter service. The country's inventory will reach 1,900 by 1908, grow to 3,000 just two years later, and top out at approximately 5,900 by 1916. The cars were utilized mainly for transporting butter from Siberia to the Baltic Sea (a 12-day journey). 1899: Refrigerated fruit traffic within the U.S. reaches 90,000 "short" tons per year; Transport from California to New York averaged 12 days in 1900. 1901: Carl von Linde equips a Russian train with a mobile, central mechanical refrigeration plant to distribute cooling to cars carrying perishable goods; similar systems will be used in Russia as late as 1975. 1905: U.S. traffic in refrigerated fruit reaches 430,000 short tons. As refrigerator car designs become standardized, the practice of indicating the "patentee" on the sides is discontinued. 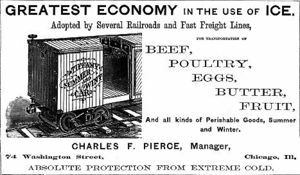 1907: The	Pacific Fruit Express begins operations with more than 6,000 refrigerated cars, transporting fruit and vegetables across the United States from Western producers to Eastern consumers. U.S. traffic in refrigerated fruit hits 600,000 short tons. 1913: The number of thermally-insulated railcars (most of which were cooled by ice) in the U.S. tops 100,000. 1920: The Fruit Growers Express (or FGE, a former subsidiary of the Armour Refrigerator Line) is formed using 4,280 reefers acquired from Armour & Co.
1923: FGE and the Great Northern Railway for the Western Fruit Express (WFE) in order to compete with the Pacific Fruit Express and Santa Fe Refrigerator Despatch in the West. 1925–1930: Mechanically-refrigerated trucks enter service and gain public acceptance, particularly for the delivery of milk and ice cream. 1926: The FGE expands its service into the Pacific Northwest and the Midwest through the WFE and the Burlington Refrigerator Express Company (BREX), its other partly-owned subsidiary. FGE purchases 2,676 reefers from the Pennsylvania Railroad. 1928: The FGE forms the National Car Company as a subsidiary to service the meat transportation market; customers include Kahns, Oscar Mayer, and Rath. 1930: The number of refrigerator cars in the United States reaches its maximum of approximately 183,000 units. 1931: The SFRD reconfigures 7 reefers to utilize dry ice as a cooling agent. 1936: The first all-steel reefers enter service. 1937: The Interstate Commerce Commission bans "billboard" type advertisements on railroad cars. 1946: Two experimental aluminum-body refrigerator cars enter service on the PFE; an experimental reefer with a stainless-steel body is built for the SFRD. 1950: The U.S. refrigerator car roster drops to 127,200. 1957: The last ice bunker refrigerator cars are built. 1958: The first mechanical reefers (utilizing diesel-powered refrigeration units) enter revenue service. 1960s: The flush, "plug" style sliding door is introduced as an option that provides a larger door to ease loading and unloading of certain commodities. The tight-fitting doors are better insulated and allow a car's interior to be maintained at a more even temperature. 1969: ACF constructs a number of experimental center flow hopper cars which incorporate mechanical cooling systems and insulated cargo cells; the units are intended for shipment of bulk perishables. 1971: The last ice-cooled reefers are retired from service. 1980: The U.S. refrigerator car roster drops to 80,000. 1990s: The first cryogenically cooled reefers enter service. 2001: The number of refrigerator cars in the United States "bottoms out" at approximately 8,000. 2005: The number of reefers in the United States climbs to approximately 25,000, the result of significant new refrigerator car orders. Pacific Fruit Express #722, an ice-cooled, express-style refrigerator car designed to carry milk in tin-plated steel cans and other highly perishable cargo at the head end of passenger train consists. Standard refrigerated transport is often utilized for good with less than 14 days of refrigerated "shelf life": avocados, cut flowers, green leafy vegetables, lettuce, mangoes, meat products, mushrooms, peaches and nectarines, pineapples and papayas, sweet cherries, and tomatoes. "Express" reefers are typically employed in the transport of special perishables: commodities with a refrigerated shelf life of less than 7 days such as human blood, fish, green onions, milk, strawberries, and certain pharmaceuticals. The earliest express-service refrigerator cars entered service around 1890, shortly after the first express train routes were established in North America. The cars did not come into general use until the early 20th Century. Most units designed for express service are larger than their standard counterparts, and are typically constructed more along the lines of baggage cars than freight equipment. Cars must be equipped with speed-rated trucks and brakes, and — if they are to be run ahead of the passenger car consist — must also incorporate an air line for pneumatic braking, a communication signal air line, and a steam line for train heating. Express units were typically painted in passenger car colors, such as Pullman green. The first purpose-built express reefer emerged from the Erie Railroad's Susquehanna shops on August 1, 1886. By 1927 some 2,218 express cars traveled America's rails, and three years later that number was 3,264. In 1940 private rail lines began to build and operate their own reefers, the Railway Express Agency (REA) being by far the largest. In 1948 the REA roster (which would continue to expand into the 1950s) numbered approximately 1,800 cars, many of which were World War II "troop sleepers" modified for express refrigerated transport. By 1965, due to a decline in refrigerated traffic, many express reefers were leased to railroads for use as bulk mail carriers. 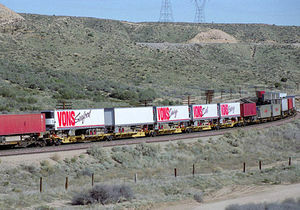 A westbound intermodal freight train passes through the Cajon Pass, Mile Post 54, in February 1995. For many years, virtually all of the perishable traffic in the United States was carried by the railroads. While railroads were subject to government regulation regarding shipping rates, trucking companies could set their own rate for hauling agricultural products, giving them a competitive edge. In March 1979 the ICC exempted rail transportation of fresh fruits and vegetables from all economic regulation. Once the "Agricultural Exemption Clause" was removed from the Interstate Commerce Act, railroads began aggressively pursuing trailer-on-flatcar (TOFC) business (a form of intermodal freight transport) for refrigerated trailers. Taking this one step further, a number of carriers (including the PFE and SFRD) purchased their own refrigerated trailers to compete with interstate trucks. The final chapter has not, as many have predicted, been written for the refrigerator car in America. The dawn of the 21st century has seen the first significant reefer orders since the early 1970s. In 1970 Tropicana orange juice was shipped in bulk via insulated boxcars in one weekly round-trip from Florida to Kearny, New Jersey. By the following year, the company was operating two 60-car unit trains a week, each carrying around 1 million U.S. gallons (4 million liters) of juice. On June 7, 1971 the "Great White Juice Train" (the first unit train in the food industry, consisting of 150 one hundred "short" ton insulated boxcars fabricated in the Alexandria, Virginia shops of Fruit Growers Express) commenced service over the 1,250-mile (2,000-kilometer) route. An additional 100 cars were soon added, and small mechanical refrigeration units were installed to keep temperatures constant. Tropicana saved $40 million in fuel costs during the first ten years in operation. Subsequently acquired units were painted bright orange. The Santa Fe Refrigerator Despatch (SFRD) briefly experimented with dry ice as a cooling agent in 1931. The compound was readily-available and seemed like an ideal replacement for frozen water. Dry ice melts at -109°F / -78.33°C (versus 32°F / 0°C for conventional ice) and was twice as effective thermodynamically. Overall weight was reduced as the need for brine and water was eliminated. While the higher cost of dry ice was certainly a drawback, logistical issues in loading long lines of cars efficiently prevented it from gaining acceptance over conventional ice. Worst of all, it was found that dry ice can adversely affect the color and flavor of certain foods if placed in too close a proximity to them. During the 1930s, the North American Car Company produced a one-of-a-kind, four-wheeled ice bunker reefer intended to serve the needs of specialized shippers who did not generate sufficient product to fill a full-sized refrigerator car. NADX #10000 was a 22-foot-long, all-steel car that resembled the "forty-and-eights" used in Europe during World War I. The prototype weighed in at 13½ tons and was outfitted with a 1,500-pound ice bunker at each end. The car was leased to Hormel and saw service between Chicago, Illinois and the southern United States. The concept failed to gain acceptance with the big eastern railroads and no additional units were built. In 1946, the Pacific Fruit Express procured from the Consolidated Steel Corporation of Wilmington, California two 40-foot able-bodied ventilator refrigerator cars, to compare the durability of the lightweight alloy versus that of steel. It was hoped that weight savings (the units weighed almost 10,000 pounds less than a like-sized all-steel car) and better corrosion resistance would offset the higher initial cost. One of the aluminum car bodies was manufactured by Alcoa (PFE #44739), while the other was built by the Reynolds Aluminum Company (PFE #45698). The cars (outfitted with state-of-the-art fiberglass insulation and axle-driven fans for internal air circulation) traveled throughout the Southern Pacific and Union Pacific systems, where they were displayed to promote PFE's post-World War II modernization. Though both units remained in service over 15 years (#45698 was destroyed in a wreck in May 1962, while #44739 was scrapped in 1966), no additional aluminum reefers were constructed, cost being the likely reason. Also in 1946 the Consolidated Steel delivered the world's only reefer to have a stainless steel body to the Santa Fe Refrigerator Despatch. The 40-foot car was equipped with convertible ice bunkers, side ventilation ducts, and axle-driven circulation fans. It was thought that stainless steel would better resist the corrosive deterioration resulting from salting the ice. The one-of-a-kind unit entered service as #13000, but was subsequently re-designated as #1300, and later given #4150 in 1955. #4150 spent most of its life in express service. Cost was cited as the reason no additional units were ordered. The car was dismantled at Clovis, New Mexico in February, 1964. ATSF #101438, one of a hundred specially-built "Conditionaire" centerflow hoppers purchased by the Atchison, Topeka and Santa Fe Railway in 1972. In 1969, the Burlington Northern Railroad ordered a number of modified covered hopper cars from American Car and Foundry for transporting perishable food in bulk. 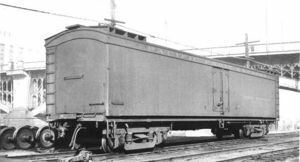 The 55 foot- (16.76 meter)-long cars were blanketed with a layer of insulation, equipped with roof hatches for loading, and had centerflow openings along the bottom for fast discharge. A mechanical refrigeration unit was installed at each end of the car, where sheet metal ducting forced cool air into the cargo compartments. The units, rated at 100 "short" tons (90.72 metric tons) capacity (more than twice that of the largest conventional refrigerator car of the day) were economical to load and unload, as no secondary packaging was required. Apples, carrots, onions, and potatoes were transported in this manner with some success. Oranges, on the other hand, tended to burst under their own weight, even after wooden baffles were installed to better distribute the load. 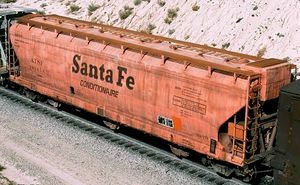 The Santa Fe Railway leased 100 of the hoppers from ACF, and in April, 1972 purchased 100 new units. The cars' irregular, orange-colored outer surface (though darker than the standard AT&SF yellow-orange used on reefers) tended to collect dirt easily, and proved difficult to clean. Santa Fe eventually relegated the cars to more typical, non-refrigerated applications. Note: Class B refrigerator cars are those designed for passenger service; insulated boxcars are designated Class L.
↑ The UIC (French: Union internationale des chemins de fer), or International Union of Railways, is an international rail transport industry body. ↑ Railway Review, January 29, 1887, p. 62: The subject cars travelled on the Erie, Lackawanna, New York Central, and Pennsylvania railroads. ↑ Source: Poor's Manual of Railroads and ICC and U.S. Census reports. ↑ Each block weighed between 200 and 400 pounds; crushed ice was typically used for meat cars. ↑ Each car required approximately 5½ "short" tons (5 metric tons) of ice. ↑ The name of the "patentee" was displayed on the car's exterior, a practice intended to "... impress the shipper and intimidate the competition ...," even though most patents covered trivial or already-established design concepts. ↑ The use of similar "billboard" advertising on freight cars was banned by the Interstate Commerce Commission in 1937, and thereafter cars so decorated could no longer be accepted for interchange between roads. ↑ The car had a single, centrally located ice bunker which was said to offer better cold air distribution. The two segregated cold rooms were well suited for less-than-carload (LCL) shipments. ↑ The mechanical refrigeration unit is housed at the car's "A" end, behind the grill at the lower left. This page was last modified 17:46, 18 May 2015.